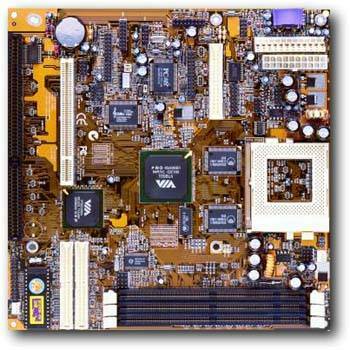 Supports all recent socket-7 processors including the Intel P55C (Pentium MMX), the Cyrix/IBM 6x86L, 6x86MX, 6x86 MII, AMD K6, K6 II, K6 III, IDT C6 and WinChip 2 and 2A processors. Supports up to 768MB of SDRAM in three 3 v 168-pin SDRAM DIMM slots. Supports both 66 and 100MHz BUS memory. This board will support both ECC and non-ECC memory modules. Onboard 64-bit VIA686 video system. Onboard C-Media CMI8738 3D full duplex surround sound system. Onboard Davicom 9102 10Base-T/100Base-TX fast PCI LAN adapter with RJ45 jack. Onboard V.90 PCTel HSP56 MicroModem which supports V.32, V.32bis, V.34, and V.90 standards. Built-in hardware monitoring circuitry to monitor the CPU core temperature, fan speed and motherboard voltages. (1) 32-bit PCI, (1) 8/16-bit ISA, (1) AT Keyboard, (1) Serial, (1) Parallel, (4) USB and (1) PS/2 port. NOTE: The USB and PS/2 ports are only available on an optional ATX form card. Support or UltraDMA 33 and 66 modes. Supports all recent socket-7 processors including the Intel P55C (Pentium MMX), the Cyrix/IBM 6x86L, 6x86MX, 6x86 MII, AMD K6, K6 II, K6 III, IDT C6, and WinChip 2 and 2A CPUs. Supports socket-7 processors with system BUS frequencies of 60/66/75/83/90/95 and 100MHz. Jumperless configuration. CPU Plug and Play support lets the firmware automatically configure the CPU. 512K external Level 2 cache memory onboard. HRTF 3D professional audio supports both Direct Sound 3D and A3D compatible interfaces plus support for 4-channel speakers. Drivers support Windows 3.1, 95, 98, NT 4.0, 2000 and Linux. Built-in 32 ohm earphone buffer and 3D surround sound. Provides MPU-401 Game/MIDI port and legacy Sound Blaster 16 support. Downloadable Wave-table Synthesizer supports Direct Music. Stereo Mixer supports analog mixing from CD-Audio, Line-in and digital mixing from Voice, FM/Wave-table and digital CD-Audio. Floppy disk drive port with 1MB/s transfer rate. Optional (4) USB ports and (1) PS/2 port with purchase of the optional ATX Form card. Built-in hardware monitoring for CPU and system temperature and fan speeds. Support AMI's Desktop Client Manager Software (ADCM). Onboard 10Base-T/100Base-TX fast PCI LAN adapter. LAN controller integrates Fast Ethernet MAC and PHY compliant with IEEE802.3u 100Base-TX, 10Base-T and ANSI X3T12 TP-PMD standards. Supports auto fallback and MNP 5, V.42bis data compression with 115200 compatible Virtual UART. Require a minimum of 16MB or dedicated RAM and Windows 95/98/NT/2000 or Linux. Will not operate in DOS mode. Supports plug and play configuration of peripheral devices and expansion cards. Built-in Antivirus protection provided by Trend ChipAway Virus which ensures that the entire boot process is virus protected. PC-Cillin provides automatic virus protection under Windows 95 and 98. AMI Desktop Client Manager (ADCM) supports hardware monitoring for stand alone workstations over a network. Gamut is an audio application that includes MP3 encoding and decoding. MediaRing Talk is an internet telephone application allowing you to make phone calls over the internet. WordPerfect Suite 8 is a Windows version office application including a word processor, spreadsheet and more. 10Base-T/100Base-TX network adapter extension bracket. ATX Form card with (2) USB ports, IR port & PS/2 port.